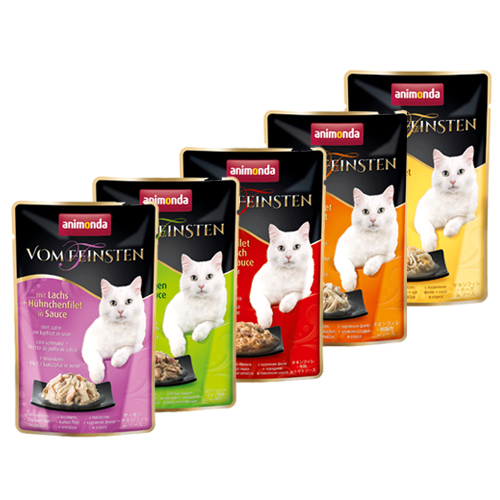 Animonda Vom Feinsten Select is a cat food supplement that contains pure chicken. It is free from maize, soy, sugar, colourings or preservatives. Animonda Vom Feinsten Select is a cat food supplement that contains pure chicken. It is free from maize, soy, sugar, colourings or preservatives. The pouches are a delicious addition to the diet of adult cats. This Animonda food supplement contains the finest selected ingredients. Soft chicken pieces are combined with 6 different flavours. The pack contains 85 gram portions, making it easy to indulge your adult cat with a different variety each day. Chicken breast & Salmon in sauce: salmon (50%), chicken breast (20%), rice (1%). Chicken breast & Cheese in sauce: chicken breast (67%), cheese (3%), rice (1%). Chicken breast & Tuna in sauce: chicken breast (49%), white tuna (21%), rice (1%). Chicken breast & Duck in sauce: chicken breast (66%), duck breast (4%), rice (1%). Chicken breast & beef in tomato sauce: chicken breast (66%), beef (4%), tomatoes (2,8%), rice (1%). Squid & Tuna and algea in clam sauce: white tuna (63%), squid(4%), clam (3%), rice (1%), algea (0,35%). Have you used Animonda Vom Feinsten Select before? Let us know what you think about this product.